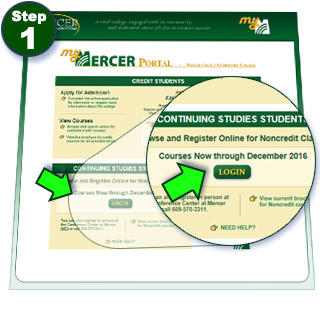 If you have not registered online and need your user name and password, please click on Continuing Studies Students LOGIN on the My Mercer Portal, and click the link for What’s is my User ID? You will need to have your Colleague student i.d. If you do not have your student i.d. call 609-570-3311 and our staff will help you. Select "Register and Pay for Continuing Education Classes." Search and Select your class on the "Register and Pay for Continuing Education Classes" screen. Enter personal information on the "Personal Identification" screen. 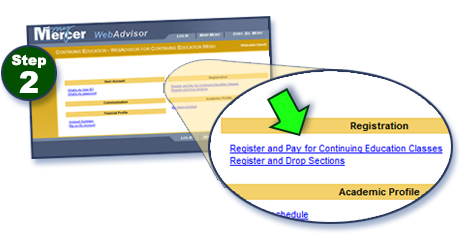 Enter additional information on the "Additional Registration Info" screen. Review and verify your choice of class on the "Pay for Classes" screen. Review and verify the payment amount for your selected class on the "Processing My Credit Card Payment" screen. Complete your transaction and register on the "Account Information" screen. Verify your information and select the "Make Payment" option. Print "Confirmation of Payment" screen for your records and continue. Click OK on "Processing My Credit Card Payment." Verify and submit "Class/Payment Acknowledgement." Check your email address you provided for acknowledgement along with User I.D. and password. Click on the "Log In" tab in the upper right corner. Enter User I.D. and Password from your email on "Change Password" screen. Pick a password that you can easily remember. You are now registered and have created a User I.D. and Password. By clicking on the Continuing Education on the Main Menu screen, you can enter by using your User I.D. and Password to access other links such as Account Summary or My Class Schedule.